Local plane spotters Jamie and Tash had great delight in capturing some stunning images of Australian Army Sikorsky S70A-9 Blackhawk A25-214 which called into Gladstone Airport on Monday 31 March. The Blackhawk - named "Tempest" - arrived from the North and after taking on fuel, departed to its home base of Oakey. Jamie and Tash report that the soldiers on board the Blackhawk were very friendly, and they thank them sincerely for letting them capture some great images as it was parked. Meanwhile, on a quiet Sunday 30 March, Jamie and Tash captured some lovely images of QantasLink Dash-8-Q400 VH-QOW which still wears its Taronga Western Plains Zoo Dubbo colours - albeit a bit faded now! 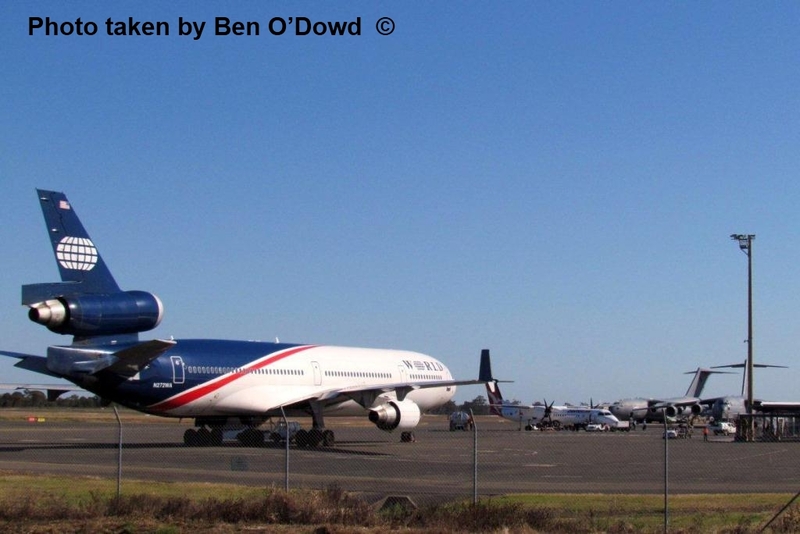 They also captured Dash-8-Q300s VH-TQH and VH-TQD which also visited Gladstone on scheduled services. Thanks guys for the awesome images! REMINDER! 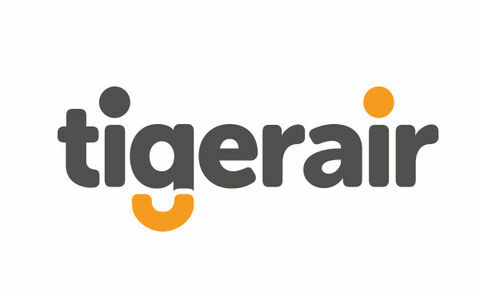 Tigerair (Tiger Airways) Services to Proserpine / Whitsunday Coast Airport Start Tuesday! 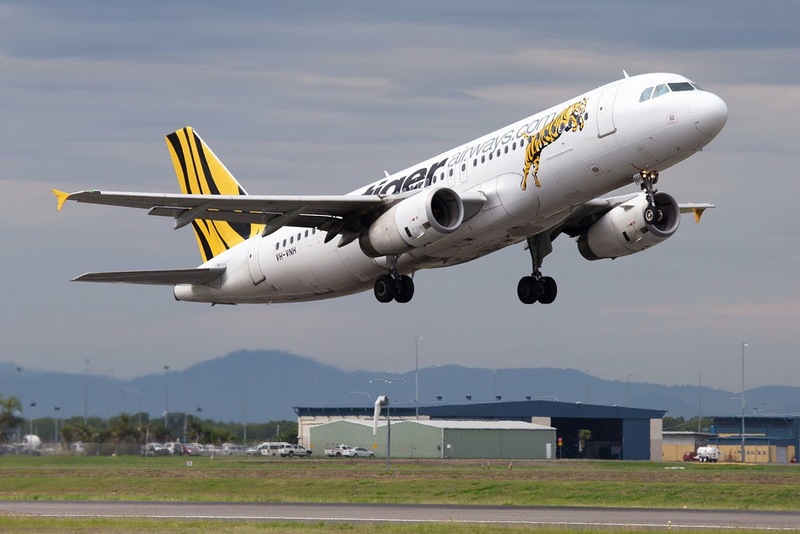 A great day for tourism in the Whitsundays this Tuesday 1 April with Tigerair Australia (Tiger Airways) starting its services from Sydney to Proserpine / Whitsunday Coast Airport - and we will be there! Operated by Airbus A320 aircraft, the thrice-weekly (Tuesday, Thursday and Saturday) services will be operated by Airbus A320 aircraft. The first TT394 flight touches down at Proserpine from Sydney as 9.45am. It will turn around as TT393 and depart at 10.15am. After next weekend - when daylight saving finishes in Southern states - these times will be an hour later. Meanwhile, Tigerair flights between Mackay Airport and Melbourne (Tullamarine) have had flight number changes, with the Tuesday, Thursday, Friday and Sunday flights re-numbered as TT744/745, while the later Wednesday and Saturday flights re-numbered as TT746/749. Finally, Tigerair recently took delivery a new A320 in Melbourne last week. The arrival of VH-XUG takes their fleet to 13 aircraft. On Sunday 30 March, Virgin Australia Boeing B737-800 VH-VUT called into Mackay Airport from Brisbane operating as VOZ605. It has just re-entered service with Virgin after being re-painted into the airline's new Virgin livery in Townsville. VH-VUU has now reportedly entered the hangar in Townsville for repainting. Meanwhile, fellow Virgin B737-800 VH-VUM flew into Mackay late on Saturday 29 March as VOZ613 from Brisbane. 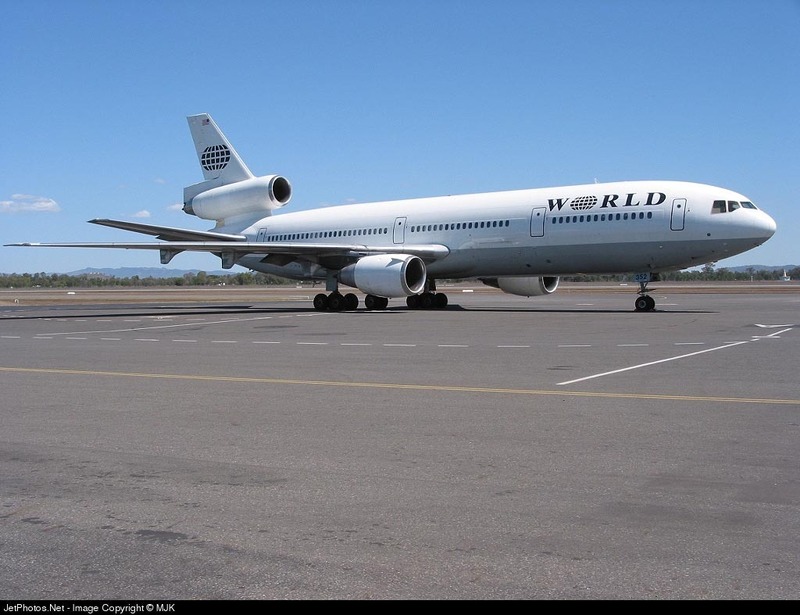 It is believed that it suffered maintenance issues and remained parked at Mackay until after lunch on Sunday 30 March when it departed - empty - back to Brisbane as VOZ9900. Mitchell Air / Australian Corporate Jet Centres' Cessna 680 Citation Sovereign VH-EXQ has visited Proserpine / Whitsunday Coast Airport over the weekend. It touched down from Sydney and Melbourne (Essendon) on Saturday 29 March and departed back directly to Essendon early on Sunday 30 March. VH-EXQ is a semi-regular visitor to Prosie, with the big bizjet noted there in November 2013. As we mentioned on our Facebook page, a bomb scare brought Gladstone Airport to a standstill late on Friday 28 March when a man alerted airport staff that he was carrying an explosive in his backpack. Local plane spotters Jamie and Tash captured some images of the scene as the terminal building was evacuated around 4.30pm, and flights were not allowed to depart or arrive at the terminal building. 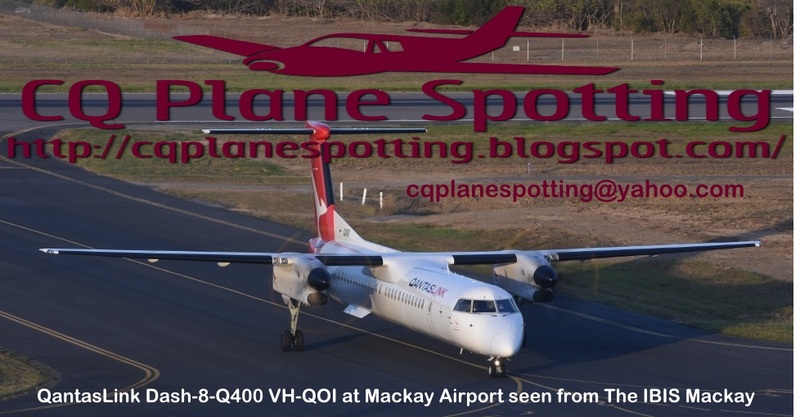 QantasLink (Cobham Aviation) Boeing B717-200 VH-NXI and Virgin Australia Regional Airlines ATR 72-500 VH-FVI were allowed to touch down at Gladstone Airport, although were forced to park away from the terminal until the all-clear was given. QantasLink Dash-8-Q400 VH-QOV was given permission to depart during the scare as it was loaded and fully prepared before the evacuation. The local Gladstone Observer newspaper reports that Gladstone Airport reopened at about 6.15pm Friday evening. They go on to report that police have charged a 50-year-old man following the incident. Police will allege the man was being processed as a passenger when he spoke about having explosives in his luggage. He has been charged with one count of falsely state bomb present and is due to appear in the Gladstone Magistrates Court next week. 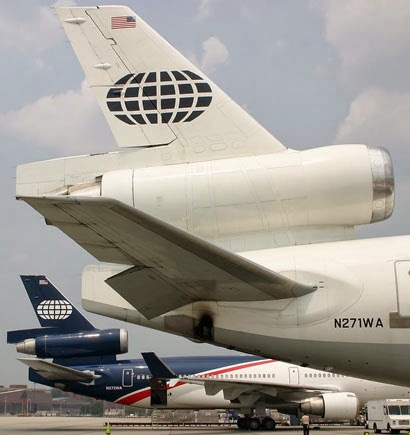 I was distressed to read this week that U.S. charter airline World Airways has ceased flying amid a failure to find financing, four months after its parent company - Global Aviation Holding - blamed U.S. Government budget cuts for a sharp squeeze in business, putting the airline into bankruptcy. World Airways was founded in 1948 and has notably transported U.S. troops around the world starting in 1951, when the U.S. entered the Korean conflict. It continued to carry U.S. military personnel and equipment to various countries around the world where troops fought and trained - including to Rockhampton Airport where U.S. troops trained in the nearby Shoalwater Bay Training Area (SWBTA) during Military Exercises including Talisman Sabre 2011 (as shown below). In recent years, World Airways operated a fleet of McDonnell Douglas DC-10 and MD-11 aircraft, along with Boeing B747-400 jumbos to transport passengers and equipment. World’s parent, Global Aviation Holdings, blamed the airline’s latest financial difficulties on the U.S. Air Mobility Command, the Air Force unit that transports military personnel and supplies, which cancelled its 2014 contract with the company as the military adjusted to a tighter budget. That decision stripped World of $54 million in revenue, the company said in its November 2013 filing in Delaware - World’s second Chapter 11 filing within a year. A second charter airline operated by Global Aviation, North American Airlines, continues to fly. 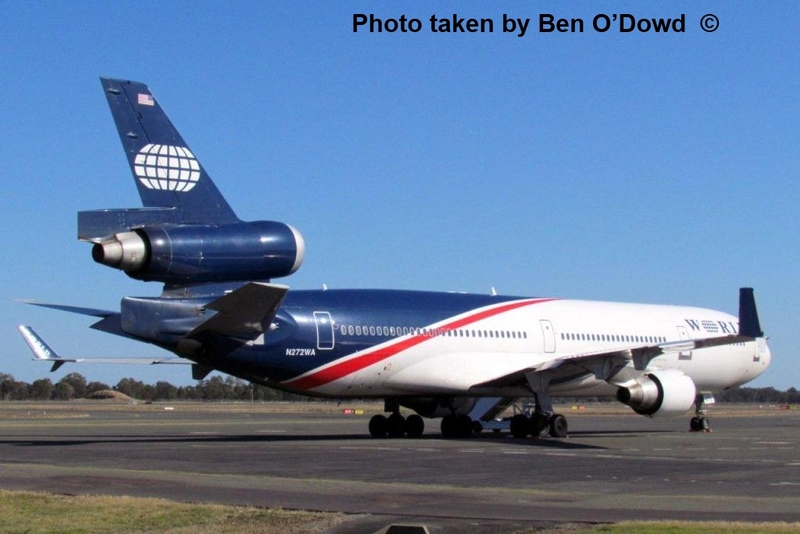 North American was founded in 1989 and operates passenger charter flights using B767-300ER aircraft. It depends less on military transport business.